The community/alternative service program is a constructive, valuable sanction available for use by a sentencing judge to allow offenders to repay his or her community by providing needed services. 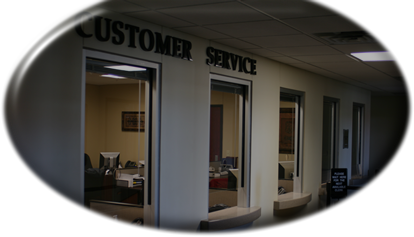 The work is performed for non-profit or governmental agencies without monetary compensation. The program makes it possible for justice to be served by enabling convicted offenders to work in the community to “pay their debt” rather than being incarcerated. • allows the offender to satisfy his or her obligations to the court and the community. Community Service is a court order mandated by the Judge as part of the judgment. Community service is generally ordered in lieu of a jail sentence. The work site is assigned by the Community/Alternative Service Coordinator. Participants do not have the option to chose their work site. Failure to abide by the assigned work schedule and the rules and regulations of the program will result in the issuance of a warrant for the offender’s arrest. At the time that the warrant is issued, any remaining community service that has not been performed will convert to jail time. Alternative Service is a voluntary program that allows individuals to work for the community to satisfy fines and costs assessed by the Court, as an alternative to making monetary payments. Participants will be given a credit of $65.00 per day for each eight (8) hour day that is completed. To participate in this program, the rules and regulations of the community service program must be followed. The work site is assigned by the Community/Alternative Service Coordinator. Participants do not have the option to chose their work site. Failure to abide by the assigned work schedule and the rules and regulations of the program will result in removal from the program and could result in the issuance of a warrant for the offender’s arrest. 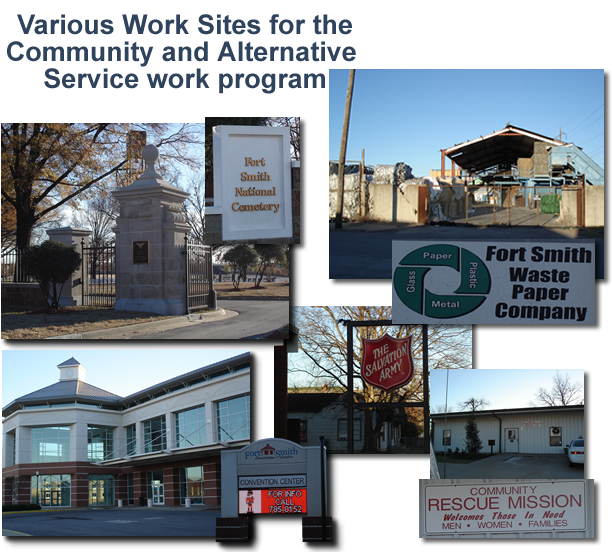 The Community/Alternative Service Program has work sites available seven (7) days a week. The work hours vary for each site. Sorry, at this time, the Program does not offer evening or night shifts. All participants are required to sign a release of claims indemnity agreement form prior to placement on the Community/Alternative Service Program. The indemnity form releases and discharges District Court, the City of Fort Smith, Sebastian County, Arkansas, and owners of all premises on which the participant may be assigned from any and all actions, causes of action, liabilities and responsibilities for personal injury or property damages of all kinds which might occur to the participant, the participant’s property or to any other person or property as a result arising from participation in the Community/Alternative Service Program. 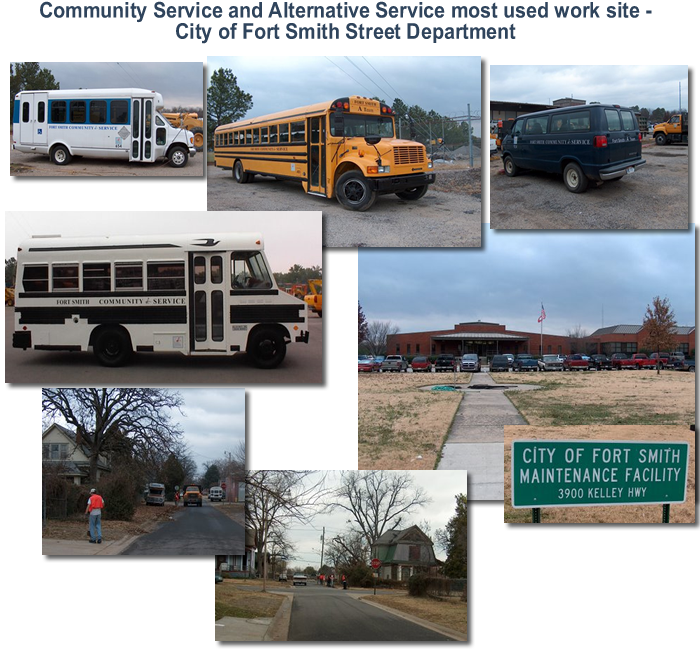 Participants of this program are responsible for making the necessary transportation and child care arrangements in order to comply with the Community/Alternative Service assignment. Participants are also responsible for making arrangements with their employer if participation in the program conflicts with their employment schedule. ABSENCES WILL NOT BE EXCUSED FOR LACK OF TRANSPORTATION, CHILD CARE OR EMPLOYMENT CONFLICTS. All participants are required to wear clothing that is appropriate for the assigned work site. For your safety, shorts and/or sandals are not allowed at any of the work sites. Participants are not allowed to leave the assigned area without permission from the site supervisor. Therefore, participants are required to bring their own lunch.